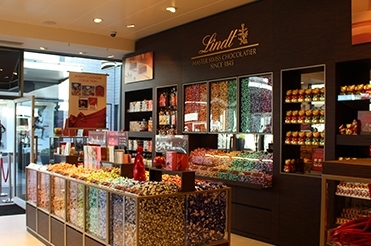 When it comes to Halloween many of us turn to multi-pack bags of chocolates and sweets to give out to any trick or treaters that come knocking, or to serve as nibbles at Halloween gatherings. Although the night is one filled with much glee and excitement from little ones (and grown ups alike!) it got us wondering whether there was something handmade with a personal touch we could be serving this year, so we took to our beloved Pinterest for inspiration. 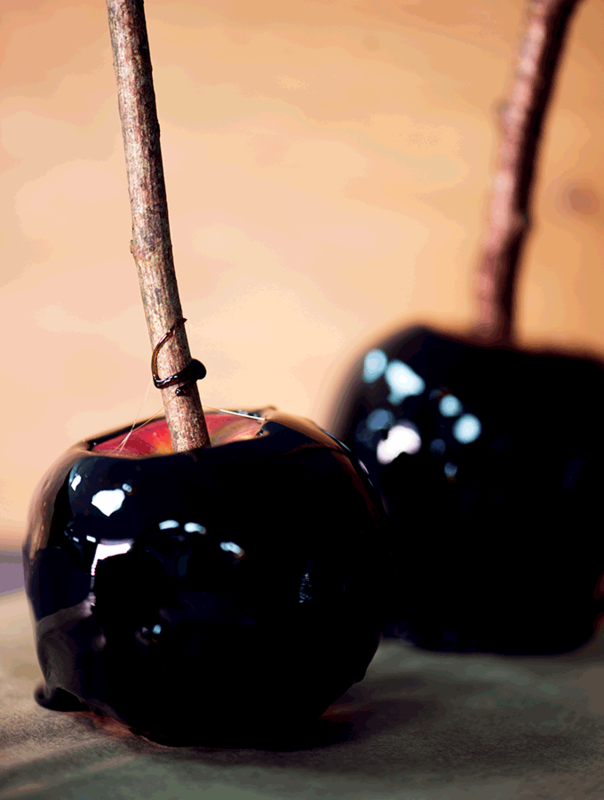 One of the first things that caught our eye were these simple, witchy poison apples – a great Halloween twist on the toffee apple we all know and love. 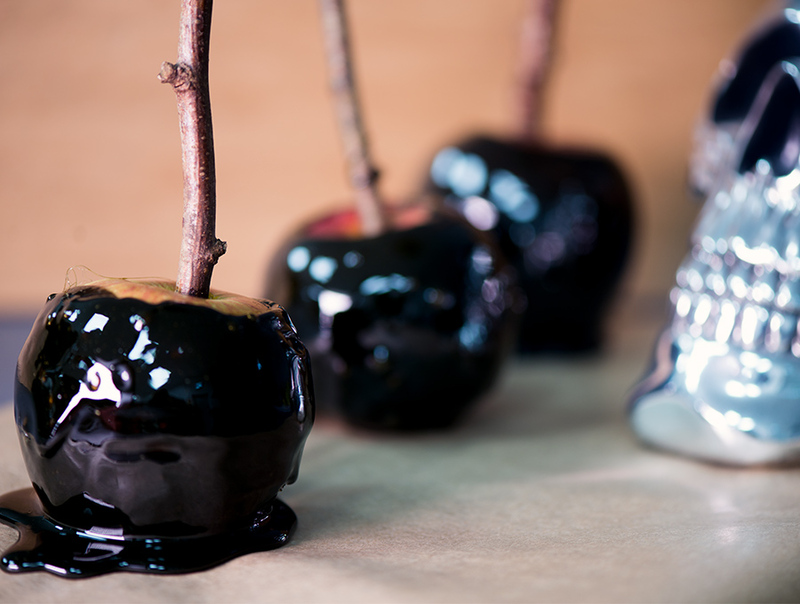 Served on an authentic wooden branch these will look great in any Halloween spread and are sure to get people talking, but the hard outer coating means these are probably best avoided if hosting little ones. Perhaps our Devilish Devil Eggs or Vegan Graveyard Chocolate Mousee will be better suited for your little monsters this Halloween? These are very straight forward to make and just require a little patience as the sugar comes to the boil, but be prepared to act fast once the sugar has got to temperature as leaving it on the heat too long will cause your sugar to burn and become unusable. Once the mix cools it quickly turns hard and becomes difficult to work with, so if you’re creating a larger batch of poison apples you may need to reheat the mix to bring it back up a consistency that is usable. To make these striking Poison Apples all you’ll need is a jam thermometer, a deep saucepan, a jug, some wooden branches carved to spikes (just make sure the branches aren’t poisonous… we don’t want actual poisonous apples!) and a rack to let these dry. The sugar coating on these apples have a beautiful shine and could easily be made into other spooky colours such as greens, blues or purples by swapping the food colouring gel but we recommend you warn guests of the hard outer shell before anyone goes in all guns blazing and hurts a tooth! Remove the stalks of the apples, and skewer through the core with a pointed branch. Pour the cold water into a saucepan and add the golden syrup and granulated sugar over a medium heat. Stir together, add the food colouring and mix well. Up the hob to medium-high and heat until it reaches 143°C (hard crack on a jam thermometer). DO NOT STIR once the mix begins to boil. Remove from the heat, carefully tilt the pan and spin the skewered apple in the mix for an even coating immediately. You will need to work quickly here as the mix will begin to harden as it cools. Place on a sheet of greaseproof paper to set. Serve on the day of making.